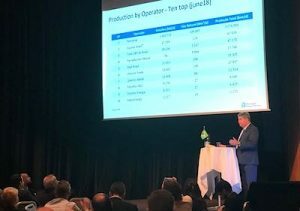 The NORWEP International Markets event on Brazil was among the most popular sessions at ONS 2018. 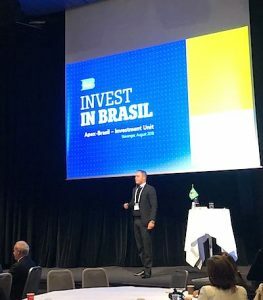 ONS took place in Stavanger, Norway from August 27-30, 2018, and NORWEP had a key role in organizing the program for a business delegation from Brazil visiting this year´s expo. Deputy Minister of Mines and Energy Márcio Felix Carvalho Bezerra. Both the Deputy Minister of Mines and Energy, Mr. Márcio Felix Carvalho Bezerra (in the photo to the left), ANP Director Felipe Kury, coordinators of the Brazilian Trade and Investment Promotion Agency APEX as well as high level Petrobras managers were present as NORWEP delegates. 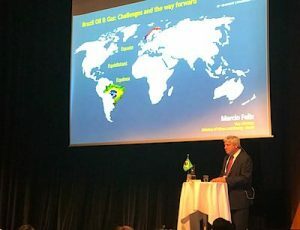 The International Markets session on Brazil took place on August 27, and it was Norway´s Deputy Minister Ingvil Smines Tybring-Gjedde who kicked off the event. She will also be present at Rio Oil and Gas this September. «Two year´s ago we were not able to put together a delegation from Brazil, but now we see that a lot have changed, and we wanted to bring a more positive, still realistic update on the Brazilian market to ONS. The Brazil session was among the International Market events with the highest attendance, demonstrating an increasing interest in the Brazilian market. The presentations were all very good, and all the participants expressed great satisfaction», NORWEP Brazil Country Manager Adhemar Freire says. NORWEP country manager from Brazil, Adhemar Freire. «Get inspired by foreign companies which have succeeded in the Brazilian market but do your homework in risk management», Mr. Freire said in his presentation, a brief market update to the audience, before Brazil´s Deputy Minister of Mines and Energy talked about the oil and gas sector in Brazil and the challenges moving forward. The new regulatory framework for exploratory activities in Brazil was on top of the agenda for the seminar. The upcoming election was listed as a concern by many speakers, but Mr. Felix also presented a series of accomplishments and regulatory changes that is making the sector more accessible to foreign investors. ANP director Felipe Kury talked about improvements, goals and opportunities in the Brazilian oil and gas industry. «We look forward to establishing a predictable and stable regulatory environment in order to provide a more business-friendly environment. We need to boost our development. There are many opportunities arising from the new and promising pre-salt discoveries. In conventional areas, our recovery factor is very low – 21 percent while the global average is 35 percent – and there is still enormous potential to be developed in Brazilian onshore areas», said Felipe Kury, according to a press release. CEO of Equinor do Brazil, Mr. Anders Opedal, was invited to talk about projects in Brazil and the company´s strategy to grow. Brazil is among the top players in oil production, consumption and reserves in the world. «Looking towards 2030,, Equinor will have a high investment and activity level. Equinor is investing USD 15 billion in Brazil, with 300.000-500.000 barrels of oil equivalents in production and is well positioned in profitable natural gas value chains. We also aim to grow within solar and offshore wind», Mr. Opedal said, according to the presentation. Dimitrios Chalela Magalhaes explained the new Petrobras procurement strategy to the participants, in a presentation called «How to do business with Petrobras». In a separate presentation, he outlined the future needs as the oil major will continue increasing production the next decade. APEX Coordinator Luiz Carvalho talked about how Brazilian government may support foreign companies looking to invest in Brazil. «Apex-Brasil works in order to foster manufacturing and technological partnerships between Brazilian and foreign companies in the oil and gas sector», he said. Petrobras executives had B2B meetings with Norwegian companies the following days. B2B meetings were also organized between APEX and Norwegian companies, and several social events were also on the agenda, providing useful arenas for networking for the delegates. «We expect to see ONS on the international agenda for Brazilian customers, companies and institutions in the next editions», NORWEP manager Adhemar Freire concludes.